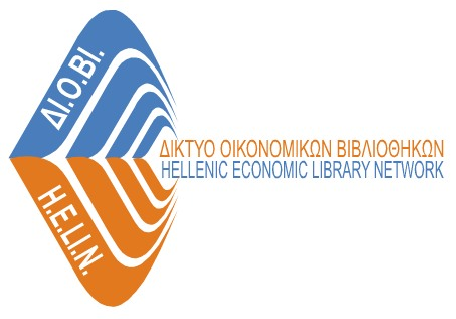 "Beyond austerity: reforming the Greek economy"
The Hellenic Economic Library Network (H.E.LI.N.) is organizing presentations of books to which H.E.LI.N. members have contributed. The goal of the presentations is to showcase quality economics books and to promote the books as valuable informational tools. UNESCO has given the distinction of World Book Capital to the city of Athens for the duration of one year, from April 23, 2018 through April 22, 2019. The H.E.LI.N. book presentations will be included within the timeframe of this distinction. H.E.LI.N. was established in 2012. It is a collaboration of libraries that are linked by their collections, their resources and their information services, all with economics content. The mission of H.E.LI.N. is to provide efficient and quality services to its user communities via an exchange of resources and services amongst the library-members. On Thursday, October 25, 2018, from 17:00 - 19:00, there will be a presentation of the collective volume "Beyond austerity: reforming the Greek economy", edited by Professors Dimitri Vayanos (London School of Economics), Nikos Vettas (Athens University of Economics and Business & Foundation for Economic and Industrial Research-General Manager), Costas Meghir (Yale University) and Christopher A. Pissarides (London School of Economics, winner of the Nobel Prize in Economics in 2010). The book was published in 2017 by Crete University Press. The book will be presented by Professor Nikos Vettas on behalf of all the editors. Two contributors to the book will then analyze the chapters on which they have collaborated as authors and will relate these chapters to other topics in the book. Daphne Nikolitsa, Assistant Professor at the University of Crete, will discuss labor issues, and Plato Tinios, Assistant Professor at the University of Piraeus, will discuss pension issues. Finally, Professor Panos Tsakloglou, Athens University of Economics and Business, will do a critical presentation, referring to the entire book. After the presentations, a discussion with the participants will follow. The event will take place at the Museum of the Bank of Greece, Amerikis 3, Athens. Entrance to the event is free. The registration form must be submitted electronically here. Seating is limited and will be done in order of priority. For more information, please refer to the H.E.LI.N. web page http://diovi.lib.unipi.gr/ and to the social media Facebook: ΔΙΟΒΙ and Twitter: diovi­_helin. Please note that the entire event will be in Greek.